The Internet, sometimes called simply "the Net," is a worldwide system of computer networks composed of other networks and individual computers in which users at any one computer can, if they have permission, get information from any other computer. The internet makes use of the TCP/IP protocol suite (to be covered later) in order to perform connections and communication. The technical coordinating body of the internet is ICANN. Network Solutions used to be responsible for assigning domain names and IP addresses. This function has now been taken over by Internet Corporation for Assigned Names and Numbers(ICANN) which is a division of the U.S. Department of Commerce. Network Solutions still maintains the master database of all domain names and IP addresses. Each distinct version of an Internet standards-related specification is published as part of the "Request for Comments" (RFC) document series. RFCs cover a range of topics in addition to Internet Standards, from discussions of new research concepts to memos about the status of the Internet. While the internet is a collection of interconnected networks and computers, the World Wide Web is the portion of the internet comprised of massive collections of files and resources that are accessible via a web browser. Client computers using a web browser send HTTP requests to a web server which returns the requested file to the client's web browser as shown below. Web communication and HTML standards are overseen by the World Wide Web Consortium (W3C). In order to handle the enormous amount of traffic that flows on the internet, it has been constructed with backbones. Backbones are high speed networks usually composed of fiber optic cable that are used to connect the smaller networks that make up the internet. Backbones connect to each other at Network Access Points (NAPs). It would obviously be impractical for everyone to spend the money to obtain the equipment necessary to connect directly to the backbones, which is how Internet Service Providers (ISPs) came about. ISPs run a network that connects to an internet backbone at a NAP and sell a service that provides a connection to the internet via their network to individuals and business. There are now several different ways to connect to an ISP including dial-up modem, DSL, T1 and cable technologies which will be discussed later. Regardless of the connection type, the graphic below shows how these concepts all fit together. Root Level Domains - The top of the tree. Second Level Domains - These domains make up the rest of networks as all sub-domains are categorized under this heading. So if you visit Intel's site, you are visiting the sub-domain intel.com. Within intel.com many other sub-domains may also exist. Hosts - Hosts are the final level in the hierarchy as they are the individual computers that occupy or comprise a domain. The Hypertext Transfer Protocol (HTTP) is a part of the TCP/IP protocol suite and is the set of rules for exchanging files (text, graphic images, sound, video, and other multimedia files) on the World Wide Web. It is the protocol controlling the transfer and addressing of HTTP requests and responses. The current version is HTTP 1.1 which allows multiple websites to be hosted from a single IP address. As the name indicates, a URL is a address used to give the location of a resource on the web. The first part is the ‘service descriptor’ which identifies the protocol being used (in the diagram above it is HTTP). The ‘//’ indicates the start of path (the root directory) which is followed by the domain name. The remainder of the address is the directory path on the server that specifies the location of the file to be fetched. You may have noticed that when you visit a domain, the complete path is not displayed. For example, if you visit our home page at http://www.mcmcse.com, there is no file specified after the domain name. If the path is not specified, the web server uses a predefined filename (usually index.htm or default.htm). In our case the server is using index.shtml as the default file. An administrator may wish to keep a web site hidden from the general public which can be done by changing the port that it is accessed on. A TCP port can be specified in the URL such as http://search.harvard.edu:4847. The TCP port can be any number in the range of 0 to 65536. The normal HTTP port id 80. The term bandwidth refers the size of the "pipe" that carries data. While often mistakenly used interchangeably with the term bandwidth, throughput refers to a measure of the amount of data flowing through the "pipe" over a given period of time. These 2 concepts are important when troubleshooting performance problems such as slow downloads or web pages taking to long to load. The table below shows the different connection types and their speeds. Dial-up connection (POTS) Up to 56 Kbps Twisted pair Rapidly being replace by faster technologies. When discussing speed, a common task is the calculation of download times. There is a conversion process involved in this since connection speeds are measured in Bits Per Second (Bps) and file sizes are measured in bytes. The formula for calculating download times is a follows: Download time = file size / connection speed. Let's take a look at an example - Let's say you wish to find out how long it will take to download a 1mb file over a 56K dial-up modem connection. The first thing we need to do is convert the connection and the file size into a common measurement - as is most commonly done, we will use bits. Our 56 Kilobit connection is easily converted to bits by multiplying by 1000 which gives us a 56000 bits per second connection. To convert the file size to bits, you need to remember that there are 8 bits in a byte and our file is 1 megabyte in size. 1 Megabyte = 1024 Kilobytes and 1 Kilobyte = 1024 Bytes. Thus, we multiply 1 x 1024 x 1024 x 8 which equals 8,388,608. We now plug our number into our forumla such that 8,388,608/56,000 = 149.78 seconds which comes to 2 minutes and 30 seconds (rounded). It is probably still a little confusing so let's do one more example. This time we want to find out how long it will take to download a 25Mb file on a T-1 connection. A T-1 connection operates at 1.544 Mbps which is 1,544,000 bits. Our file is converted to bits by multiplying 25 x 1024 x 1024 x 8 which equals 209,715,200 bits. We then plug these numbers into our formula as follows: 209,715,200/1,544,000 = 135.83 seconds or 2 minutes and 16 seconds (rounded). The following calculator will help you verify conversions. There are a wide (and growing) variety of types of internet clients. From a hardware perspective, these can include desktop computers, Portable Digital Assistants (PDAs), E-mail machines, cell phones, WebTV, etc. Different types of software clients are then loaded on these devices in order to access the various resources and services that are available on the internet. Software clients can include applications such as browsers, e-mail clients, FTP clients, etc. A browser is the software application run on an internet client that provides a GUI interface for accessing files on the WWW. The most popular browsers are Microsoft's Internet Explorer and Netscape's Navigator. Browsers use the HTTP protocol to communicate with web servers. Clients can utilize a couple of different methods to receive content from the internet. Pull technology is used whenever a client pulls information from a server while push technology involves information being automatically delivered to a client without the need for a request. A client needs to have the proper TCP/IP settings configured including IP address, subnet mask and gateway address in order to access the internet. Furthermore, if the client is behind a proxy server, the browser needs to be configured with the proxy server information. Browsers can save files from a visited web site on the local hard drive - a process known as Browser Caching or client-side caching. The next time a request is made to visit this same web site, the files will be pulled from the cache on the local hard drive instead of downloading them over the internet connection. Loading the files from cache is faster than downloading them, however, if changes are made to a cached web site, you may not be able to see them unless you reload the web page and force the browser to download the pages again. Periodically, the browser cache may need to be cleaned out to preserve disk space. Microsoft's WebTV enables interactive television shows and internet browsing using the television as a monitor. Because WebTV acts as a web browser, web designers should make sure that they test their web sites on this platform as there are differences between how sites are displayed on WebTV and a regular browser. Cookies are unencrypted text files stored on the client computer that store information about the user for use on a web site. They are commonly used to customize pages for you based on your browser type or other information and preferences that you may have provided the Web site. Most browsers will accept cookies by default, however, the security settings can be changed to reject them. If this is done, some web pages will lose functionality or not work correctly for that user. An expiration date can be set in a cookie. If no expiration is set, the cookie will expire when the browser is closed. A single domain is restricted to only setting 20 cookies and each cookie can be a maximum of 4KB in order to prevent client machines from being inundated with cookies and filling up hard drive space. SMTP - SMTP is responsible for sending mail. Usually it is sent to a POP3 server. POP3 - POP3 is the responsible for downloading email from a POP3 server to an email client such as Outlook or Eudora. Email is often used for mailing lists which can distribute a newsletter, advertisement, etc to a group of subscribed members that usually "opt-in" to join the list. A Listserver is responsible for handling this type of mass email distribution. Unwanted email is known as SPAM. An important part of email is the concept of net etiquette or "netiquette". There are a variety of commonly accepted rules for displaying good netiquette including things such as not typing emails in all caps and not sending email to those who do not wish to receive it (SPAM). MIME stands for Multipurpose Internet Mail Extensions and was created because the SMTP protocol was designed to handle ASCII text only. MIME allows for binary files such as images to be sent via email. Web browsers use MIME to understand how to display non-HTML data within the browser. Servers insert the MIME header at the beginning of any Web transmission. Clients use this header to select an appropriate "player" application for the type of data the header indicates. On a similar note BinHex is used to encode Macintosh files for network transfer or email attachements. The file transfer protocol (FTP) is the primary method of transferring files over the Internet. As a user, you can use FTP with a simple command line interface (for example, from the Windows MS-DOS Prompt window) or with a commercial program that offers a graphical user interface such as WS_FTP. Two transfer modes are used in FTP. ASCII and BINARY. ASCII mode is used for the transfer of files consisting of plain text while the BINARY mode is used all types of files not consisting of plain text (such as sound, video, executables, images etc). Failure to upload files in the proper format can cause them not to display correctly or at all. open - This command is used to establish a connection to a FTP host. Example: open ftp.idsoftware.com. close - This command is used to disconnect from a FTP host. Example: close. get - This command is used to download a file from a FTP host. Example: get agenda.txt c:\myagenda.txt. This command downloads the file agenda.txt and puts it into the c:\ directory with the name myagenda.txt. The second parameter is optional. put - This command uploads a file from the local computer to a FTP host. Example: put recipe18.txt pudding.txt. This command uploads the file recipe18.txt on the server by the name pudding.txt. The second parameter is also optional for this command. mget - This command downloads multiple files. You can specify criteria for the files by using wildcards. The arguments are same as get. mput - Used to upload multiple files. The arguments are the same as put. type - Used to change transfer mode. Example: type a or type I. A newsgroup is a discussion about a particular subject consisting of notes written to a central Internet site and redistributed through Usenet, a worldwide network of news discussion groups. The Network News Transfer Protocol (NNTP) is the protocol used by computer clients and servers for managing the notes posted on Usenet newsgroups. Internet Relay Chat (IRC) is a system for chatting that involves a set of rules and conventions and client/server software. On the Web, certain sites provide servers and help you download an IRC client to your computer. Telnet is a protocol that allows you to connect to remote computers over the Internet. There is a telnet server on the remote host, which the telnet client negotiates with to establish a connection. Once connected, the client becomes a virtual terminal, and allows you to interface with the host computer from your computer. In most cases, you'll be asked to log into the remote system. This usually requires an account on that host. Occasionally you can log in as guest or public without having an account. Encryption alters data into an unreadable form so that if the data is intercepted, it will be useless to those that view it unless they the keys necessary to decode the data. Most encryption is done using a mathematical formula called an algorithm which includes keys that are used to decrypt the data. Public key encryption is an encryption method that utilizes 2 keys in which 1 key is used to encrypt the data and is available publicly while the other key is kept on the users computer and is used to decrypt the data. SSL stands for Secure Sockets Layer and provides data encryption and authentication services which are important for e-commerce transactions. HTTPS signifies that the web page is using the Secure Sockets Layer (SSL) protocol and is providing a secure connection. A server SSL certificate is used for internet business transactions allowing customers to verify that a business is legitimate. CA certificates are used to identify the companies that are responsible for issuing certificates to others and are known as a Certificate Authority. Object-signing certificates are for signing objects such as files to provide information to customers. S/MIME certificates are used to protect/encrypt sensitive email. SET stands for Secure Electronic Transaction. SET gives users a digital certificate and a transaction is conducted and verified using a combination of digital certificates and digital signatures among the parties involved in the transaction in such a way that ensures privacy and confidentiality. VPN stands for virtual private network. A VPN provides secure communications over public telecommunications infrastructures by utilizing encryption and a tunneling protocol such as PPTP and L2TP. A VPN is a virtual private network and is designed for situations where security is paramount such as allowing outsiders to connect to a corporate LAN. When selective access is provided to entities outside an organization, an intranet becomes an extranet. Extranets can potentially allow unwanted internet users access to your company network which is why VPNs are commonly used with extranets. DOS - A denial of service (DoS) attack is a common type of attack in which false requests to a server overload it to the point that it is unable to handle valid requests. There are several different types of DoS attacks including Syn Flooding and Ping Flooding. Ping Flooding - The ping utility utilizes the ICMP protocol. A Ping Flooding attack is one in which the server is overloaded with Ping requests that it cannot keep up with. A similar attack called "Ping of Death" sends overly large packets (over 64 bytes) to computer which will shut it down if it is not able to handle packets of that size. Man-in-the-middle - These attacks can include the interception of email, files, passwords and other types of data that can be transferred across a network. This is a form of Data Theft attack. IP spoofing - A technique used to gain unauthorized access to computers, whereby the intruder gives off the appearance that the packets they are sending are coming from a trusted host. To engage in IP spoofing, an attacker must modify the packet headers so that it appears that the packets are coming from the trusted IP address. Virus - The most common computer infestation, viruses rely on other programs such as an email client to replicate themselves. There are many different brands of Anti-Virus software used to detect and eliminate viruses on computers. Virus definition files are what tell the anti-virus software what to look for and how to fix a particular virus if found. Because new viruses are being released all of the time, it is very important to keep the virus definition files up to date. Worms - Worms are stand alone programs that do need other programs in order to replicate themselves like a virus which relies on users to inadvertently spread it. Trojans - A Trojan is a type of file that appears to do one thing, but in reality does another. A Trojan can be a file that operates in an expected way, but also has a secret operation that subverts security. Once a Trojan is installed, it can perform a wide variety of destructive tasks and/or provide secure information to the attacker. Copyright owners have the right to reproduce their work for the purpose of sale and to prevent others from copying or re-using their material. Copyright does not prevent others from using the ideas or information revealed by a piece of work. Copyright does not protect procedures, processes, systems, methods of operation, concepts, principles or discoveries. Copyrights are obtained through the Library of Congress and last for 50 years after the owner's death. A trademark is a word, name, symbol, phrase, or logo used in commerce to identify the goods manufacturer and to distinguish the goods from those of other companies. Servicemarks provide a similar function but apply to services. Electronic Data Interchange (EDI) is the computer-to-computer exchange of business information using a public standard. EDI is a central part of e-commerce, because it enables companies to exchange business information electronically much faster, cheaper and more accurately than is possible using paper-based systems. The parties who exchange EDI transmissions are referred to as trading partners. Transaction processing software receives and validates credit card information and passes it along to the appropriate financial institution. This type of software may also include order tracking functions. Most browsers can display GIF, GIF89a and JPEG formats while newer browsers have added support for the PNG format. Following is a list of the different file formats that one might find on the internet. JPEG - JPEG is a 24 bit bitmap format that can be a very efficient way to compress graphics for web sites due to its use of lossy compression. You can select how much to compress a file, and therefore how much information is lost. The JPEG format does not support animation or transparency. GIF - Graphics Interchange Format is a palette based format that can have a maximum of 256 colors, or 8 bits, chosen from a total of 16.7 Million, or 24 bits. GIFs can also be animated (GIF89a format only) and support transparency. GIFs also support interlacing in which the image is first displayed at its full size with a very low resolution, then at progressively higher resolutions until it finally attains a normal appearance. Flash - Flash is used to create vector graphics-based animation programs that are small enough to stream across a normal modem connection. In order for a web browser to display Flash animation, a plug-in must be installed on the user's system. For more information about the difference between vector and bitmap images read this tutorial on the subject. PNG - Portable Network Graphics was designed to replace the GIF format, and challenge JPEG for many purposes. PNG is capable of color depths from two colors, or 1 bit, to 16.7 million colors with an Alpha channel, or 32 bit and supports transparency. BMP - BMP files are the default bitmapped images used in on Windows operating systems. BMP files can support up to 16.7M colors. TIFF - TIFF files are bitmap images commonly used in desktop publishing, faxing, 3-D applications, and medical imaging applications. A plug-in is required to view TIFF images in a browser. PDF - Portable Document Format files can be read on any platform with Adobe’s Acrobat Reader. In order to view PDF files in a web browser, a plug-in must be installed. VRML - Virtual Reality Modeling Language allows the display of 3-D objects within a web browser with the installation of a plug-in. Shockwave - Supports animation, audio and video on the web. Shockwave is installed as a Netscape plug-in or an ActiveX control. Real Player - Plays streaming RealAudio and RealVideo files. Streaming media software utilizes User Datagram Protocol(UDP), Real Time Transport Protocol(RTP) and Real Time Streaming Protocol(RTSP). Windows Media Player - This player was developed by Microsoft and plays a wide variety of media types. In order to pass the exam, you do not need to know how to program, but you do need to know the various programming languages and their properties as listed below. It is important to note the difference between scripts that are executed on the server (server-side) and those that are performed on the client (client-side). ASP - An Active Server Page (ASP) is an HTML page that includes one or more scripts that are processed on a Microsoft Web server (server-side) before the page is sent to the user. Because the server only returns HTML back to the client, these pages can be viewed in almost any web browser and do not require a plug-in or other 3rd party software. This technology is a feature of Microsoft's web server known as Internet Information Server (IIS). ASP allows for the creation of user specific environments and interactive web pages. Perl - Perl (Practical Extraction and Reporting Language) is a server-side script programming language that is used largely as a language for developing CGI programs. CGI stands for Common Gateway Interface and is a standard way for a Web server to pass a Web user's request to an application program. CGI programs can tend to be server intensive. Perl requires that a Perl Interpreter is loaded on the web server. Java - Developed by Sun Microsystems, Java is an object-oriented client-side programming language derived from C++ that is run on a client with the use of a Java Virtual Machine. Java applications found on the web are known as applets. Java is platform independent. C - The C programming language is one of the oldest and is used for writing applications and operating systems. C++ - The newer object-oriented version of C.
Visual Basic - A programming language with a graphical environment from Microsoft used to create applications. XML - XML is the Extensible Markup Language. It is designed to improve the functionality of the Web by providing more flexible and adaptable information identification. It is called extensible because it is not a fixed format like HTML (a single, predefined markup language). Instead, XML is actually a `metalanguage' -- a language for describing other languages. Channel Definition Format - CDF is an application made up of Extensible Markup Langugage (XML) used to create channels. Channels use push technology to deliver web content to subscribers. Flat-file - This type of database stores all of its information in one table. While this type of database is still used to store smaller amounts of information, it is not a good solution for larger information stores. Relational - A relational database stores information in tables with the ability to link data between tables at the record level. For this reason relational databases are faster and more scalable. Our Training Directory utilizes a relational database. Information is retrieved and updated in databases via the use of the Structured Query Language (SQL). In order for programs to use SQL requests that will access databases without having to know their proprietary interfaces, the Open Database Connectivity (ODBC) application programming interface (API) was developed. ODBC can be used to allow a web server to pull information out of a database and return the data in HTML form to a web browser. HTML stands for Hyper-text Markup Language and is used to create web pages. HTML tells a web browser how to display the text and graphics that will be on a web page by utilizing tags which are placed between angle brackets - <>. There are 3 required tags for an HTML document which are HTML, HEAD and BODY. Some of the tags are ‘containers’ and they take a starting as well as an closing tag. For example, <HTML> is the starting tag and </HTML> is the closing tag. Some important HTML tags are discussed below. <HTML> - Starts a new HTML document. <HEAD> - Starts the HTML header. <BODY> - Starts the HTML body. <H1>, <H2>…<H6> - Starts a heading of level 1 to 6. <B>, <I>, <U> - Bold, italic, and underline. <A> - Anchor. Inserts a link or target. A link would be formatted as <a href="http://www.mcmcse.com">. <IMG> - Insert and image or video. An example would be <img src="http://www.mcmcse.com/example3.jpg">. <TITLE> - Used to give the title of the web page. An image map is a single image that is broken down into sections that can have a unique URL associated with it. For example, an image map could be an image of the United States with each state taking the user to a different web page when clicked on. Tables are defined with the <table> tag. A table is divided into rows (with the <tr> tag), and each row is divided into data cells (with the <td> tag). The letters td stands for "table data," which is the content of a data cell. A data cell can contain text, images, lists, paragraphs, forms, horizontal rules, tables, etc. Below is an example of a table and it's source code. There are a number of attributes that can be assigned to the tags used in tables to specify dimensions, colors, borders, etc. Forms are widely used on the internet to collect information from users. You have most certainly run into them when registering for a site, filling out an online survey or placing an order. Forms allow users to enter information into fields that are to be processed by a server and most likely stored in a database when the information is submitted. CSS stands for Cascading Style Sheets and is a simple styling language which allows a webmaster to attach style to HTML elements in order to control margins, fonts, colors, etc. CSS stores this information in templates called style sheets. CSS can be used to create uniformity amongst the pages of a web site as well as providing an easy method to update style elements for a web site by simply modifying the style sheets instead of editing every page on the web site. A server-side include is a variable value that a server can include in an HTML file before it sends it to the requestor. This can be used for a variety of functions such as adding a file "Last modified" date. By default, SSI requires an SHTML extension, although while not commonly practiced, a web server can be configured to use other extensions for SSI. Many search engines use spiders to index a web site by looking at TITLE tags, the content of the 1st paragraph and META tags. Meta tags are entered into the HEAD portion of the document and can list a web page's description and keywords which will be used during indexing. Once visitors have arrived at your site, there are a couple of things that you can do to help them find their way around. First, you can use an index server to make your site searchable. An index server works in a similar fashion to a search engine spider. You can also add a site map to your web site which is a directory of the resources that are available to your visitors. All People Seem To Need Data Processing. The first letter of each word corresponds to the first letter of one of the layers which are explained in the table below. This topology is an older one and essentially has each of the computers on the network daisy-chained to each other. This type of network is usually peer to peer and uses Thinnet(10base2) cabling. It is configured by connecting a "T-connector" to the network adapter and then connecting cables to the T-connectors on the computers on the right and left. At both ends of the chain the network must be terminated with a 50 ohm impedance terminator. As you can see if computer #1 sends a packet to computer #4, it must pass through computers #2 and #3, creating excess traffic. The star is probably the most commonly used topology today. It uses twisted pair(10baseT or 100baseT) cabling and requires that all devices are connected to a hub. The ring topology looks the same as the star, except that it uses special hubs and ethernet adapters. The Ring topology is used with Token Ring networks. Hybrid - Hybrid topologies are combinations of the above and are common on very large networks. 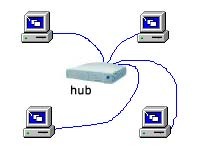 For example, a star bus network has hubs connected in a row (like a bus network) and has computers connected to each hub as in the star topology. Mesh - In a true mesh topology every node has a connection to every other node in the network. A full mesh network can be very expensive, but provides redundancy in case of a failure between links. NIC - Stands for Network Interface Card and is the adapter card that is installed in a computer that provides connectivity to a network. Modems - The most common and inexpensive way for home users to connect to the internet is via the use of a modem connected to telephone lines. While this technology is rapidly being replaced by DSL and Cable technologies, you will still need to know about this connection type. Hayes Corporation developed a smart modem which accepted AT type commands. This is now a widely accepted standard that can be used to directly communicate with the modem (via hyperterminal). To the right are some of the common AT commands that you may need to know. When using a modem, call waiting should be disabled otherwise your connection will be disabled when incoming telephone calls come in. Bridges - Functions the same as a repeater, but can also divide a network in order to reduce traffic problems. A bridge can also connect unlike network segments(ie. token ring and ethernet). Bridges create routing tables based on the source address. If the bridge can't find the source address it will forward the packets to all segments. Routers - A router will do everthing that a bridge will do and more. Routers are used in complex networks because they do not pass broadcast traffic. A router will determine the most efficient path for a packet to take and send packets around failed segments. Unroutable protocols can't be fowarded. Gateways - Often used as a connection to a mainframe or the internet. Gateways enable communications between different protocols, data types and environments. This is achieved via protocol conversion, whereby the gateway strips the protocol stack off of the packet and adds the appropriate stack for the other side. Firewall - Either a hardware or software entity that protects a network by stopping network traffic from passing through it. In most cases, a firewall is placed on the network to allow all internal traffic to leave the network (emails to the outside world, web access, etc. ), but stop all traffic from the outside world from entering the internal network. Internet Applicances - Internet appliances are increasing in popularity for home use due to their very low cost. Internet appliances possess very little hardware power and are designed to perform limited internet tasks such as email and web browsing. Palm Pilot's are handheld computers that can perform a variety of tasks. Cache Server - A Cache server saves Web pages and other files that users have requested so that subsequent requests for the same data can be retrieved from the cache server rather than downloading the information again. Many proxy servers offer this functionality. Proxy Server - A proxy server acts as a middle-man between clients and the Internet providing security, administrative control, and caching service. When user makes a request for an internet service, if it passes filtering requirements, the proxy server looks in its local cache of previously downloaded web pages. If the item is found in cache, the proxy server forwards it to the client. This reduces bandwidth through the gateway. If the page is not in the cache, the proxy server uses Network Address Translation (NAT) to use one of its own IP addresses to request the page from the appropriate server. IP is a connectionless protocol, which means that a session is not created before sending data. IP is responsible for addressing and routing of packets between computers. It does not guarantee delivery and does not give acknowledgement of packets that are lost or sent out of order as this is the responsibility of higher layer protocols such as TCP. As opposed to IP, TCP is connection oriented and assures reliable delivery of packets. When the destination host receives a segment it sends back an acknowledgement(ack). If an ack is not received by the source host within a certain period of time then the data is retransmitted. TCP uses sockets and ports to exchange data between applications. Ports provide a specific and universal location for message delivery, while sockets use the host ip address, port number and the type of service (TCP or UDP) to create a reliable connection. Every IP address can be broken down into 2 parts, the Network ID(netid) and the Host ID(hostid). All hosts on the same network must have the same netid. Each of these hosts must have a hostid that is unique in relation to the netid. IP addresses are divided into 4 octets with each having a maximum value of 255. We view IP addresses in decimal notation such as 124.35.62.181, but it is actually utilized as binary data so one must be able to convert addresses back and forth as shown in the following table. When converting binary data to decimal, a "0" is equal to 0. "1" is equal to the number that corresponds to the field it is in. For example, the number 213 would be 11010101 in binary notation. This is calculated as follows: 128+64+0+16+0+4+0+1=213. Remember that this only represents 1 octet of 8 bits, while a full IP address is 32 bits made up of 4 octets. This being true, the IP address 213.128.68.130 would look like 11010101 10000000 01000100 10000010. Class A addresses are for networks with a large number of hosts. The first octet is the netid and the 3 remaining octets are the hostid. Class B addresses are used in medium to large networks with the first 2 octets making up the netid and the remaining 2 are the hostid. A class C is for smaller networks with the first 3 octets making up the netid and the last octet comprising the hostid. Class D addresses are used for multicast broadcasts and class E addresses have been reserved for future use. You will not likely come into contact with addresses from these ranges. There are several other special addresses and ranges that you should know. The Loopback address is 127.0.0.1. This address is used to determine if TCP/IP has been properly installed on your computer. This can be done by pinging 127.0.0.1. There are also 3 private address ranges that are used for private networks. These are 10.x.x.x, 172.16.0.0 - 172.31.255.255, and 192.168.x.x. These ports are the default, and if you change the service to another port, those accessing it must specify the new port in their request. For example, if the web service is changed from port 80 to port 8080, the URL to access our site becomes: http://www.mcmcse.com:8080. Prevents users from making up their own IP addresses. Prevents incorrect gateway or subnet masks from being entered. Decreases amount of time spent configuring computers especially in environments where computers get moved around all the time. Handy in situations where you have a large sales staff that work remotely. On that one day they bring their laptops and they can just plug them into the network and they are all set. Primary Nameserver - Gathers DNS information from local files and is a focal point for adding hosts and domains. Secondary Nameserver - Gathers the data for its' zone(s) from another DNS server. Secondary nameservers provide redundancy, traffic on primary server and quicker access for locations that are remote in regards to the primary server. Caching Only Servers - These do not have a zone that they are responsible for. Their databases only contain info that is received from resolutions that it has made since the the server was last started. Different records are used in the DNS database for different types of resources on a network. Below are the most common DNS record types. SOA A Start of authority (SOA) record is the first entry in every DNS server. It contains the email address of the DNS server's administrator and other information about DNS server database. A Maps an IP address to a host's name. NS This record is used to designate other name servers. CNAME Host's canonical name used for creating aliases. An example would be our labs located at lab.mcmcse.com. While the contents of this web page are actually hosted on another server, a CNAME record has been set up giving the appearance that these pages are a part of MC MCSE. MX Points to the Mail server for the domain. LDAP stands for Lightweight Directory Access Protocol which is used by programs to query directories. The following are the most common tools used for troubleshooting TCP/IP on the internet. PING Probably the most important. This verifies that TCP/IP is configured correctly and that a connection can be made. WINIPCFG Allows you to view TCP/IP settings and configuration as well as release/renew addresses with a DHCP server. IPCONFIG Same as above for use on NT systems. TRACERT Enables you to view the route to a specified host. This will show how many hops the packets have to travel and how long it takes. ROUTE View or change entries in the routing table. ARP View and add entries to the ARP cache. NBTSTAT Check NETBIOS connections and update LMHOSTS cache.